Under the leadership of TU Graz, an international research team has developed a contrast medium concept for MRI, promising unprecedented features in medical imaging. 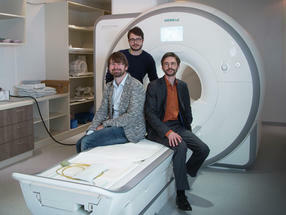 After three years of research in the framework of the CONQUER FET Open project, Scharfetter and his team have now achieved a breakthrough in groundbreaking features in medical imaging. The novel contrast medium was able to be developed to the point that the explored effect can be used with the field strengths of standard MRI scanners. ‘We continue to measure the NMR signal of the hydrogen nuclei, but change the relaxation through the interaction with the quadrupole nuclei and thus the contrast. To do this, we only had to modify a standard MRI scanner in such a way that we were able to slightly shift the magnetic field in order to switch the contrast on or off. The results have been published in the high impact journal Physical Review Letters X and an EU patent applied for.